It's important to wear sunscreen every day, even in the winter, and especially when it's overcast. You don't have sit on the beach to aquire harmful effects of UVA and UVB rays. That being said, many sunscreens on the market leave a greasy, white-cast after-effect once their applied and rubbed in. But not all of them. There are plenty matte sunscreens that offer up a nice, non-oily finish and even a few options that work well as a primer for makeup and ones that specifically nix shine altogether. Those are the formulas we're focusing on today (for those looking for a dewy finish, we got you). I tapped our editors for their favorite options, and added a few of my own, to narrow down the often harrowing choices. From powders and CC creams to lotions and serums, keep scrolling for our favorite matte sunscreens on the market. Each one offers up effective sun protection as well as a fresh, matte finish. You're going to love them. "For me, a matte sunscreen implies it'll translate into a gluey, chalky consistency," Lindsey says. 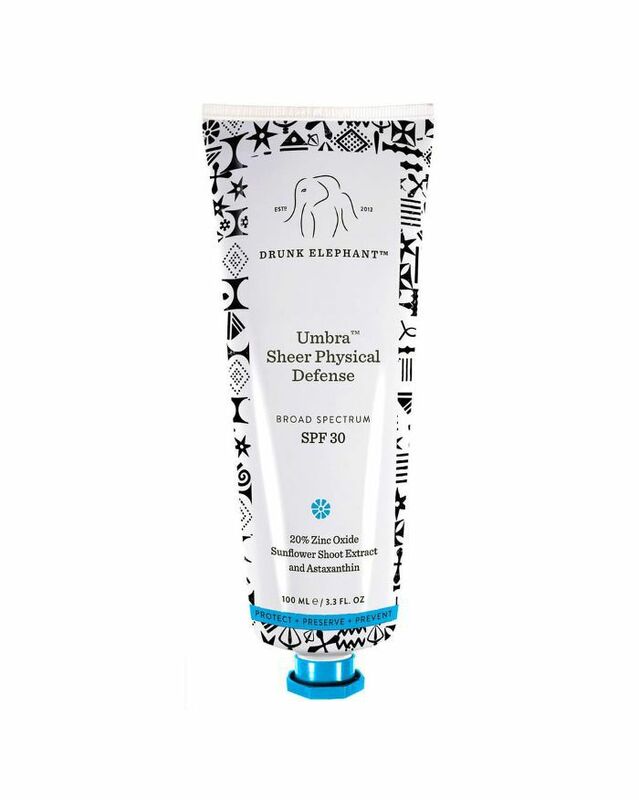 "I only love lightweight, easily blendable sunscreens that melt into skin with no trace of residue (I'm assuming I'm not alone in this camp), but I was pleasantly surprised by the matte texture of Drunk Elephant's facial sunscreen." She continues, "It's a bit thicker than I'm used to (even though it has "sheer" in the name), but there's no ounce of chalkiness and works well underneath my foundation. I'm especially excited to break it out in the summertime when I hit the beach knowing I won't look ghostly in my vacation selfies." This non-chemical tinted lotion is more than just powerful sun protection—it delivers feel-good ingredients that are actually good for your skin (botanical and antioxidants that nourish and won't clog pores like kakadu plum, eucalyptus and red algae) as well as a powder finish to nix sweat and shine. 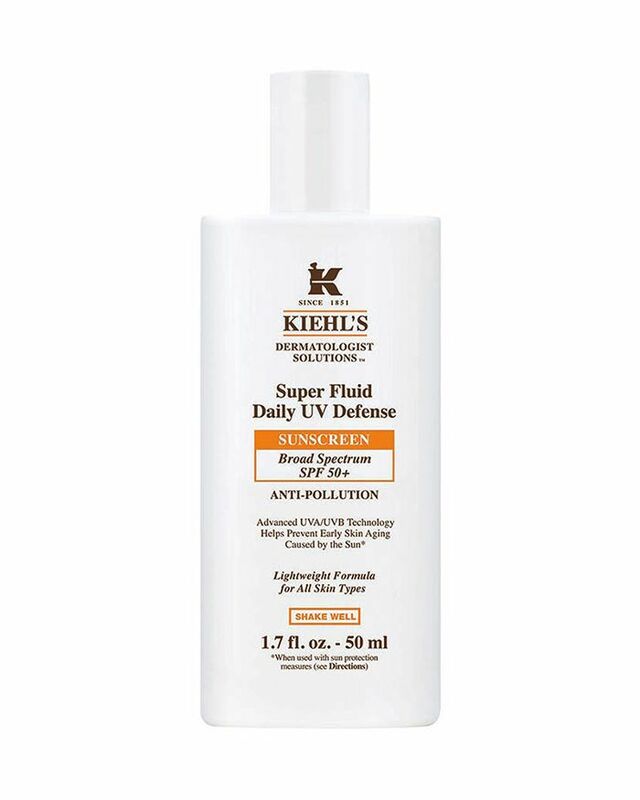 It has an SPF of 50, it's water resistant, and you can buy it at the drugstore. Score. Packed with hydrating, protecting including organic rose hip and evening primrose oils, shea butter, and cucumber, this nourishing, lightweight cream absorbs quickly into your skin to protect from sun damage. It doesn't leave behind that sticky, white finish but rather works to mattify your skin and is especially helpful for oily skin types. Plus, it smells like a spa and that's especially lovely. Tatcha's sunscreen delivers lightweight, silky texture and a mattifying effect each time you apply. In fact, a few of our editors prefer it to traditional, non-SPF primer as it never leaves a chalky finish, smoothes and blurs pores, and keeps shine to a minimum. 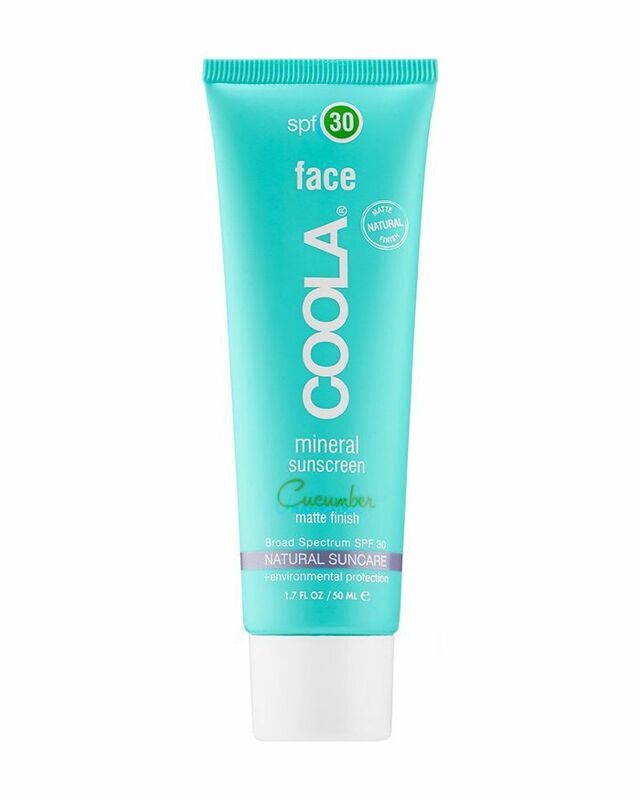 It's a perfect everyday sunscreen, one that doesn't feel greasy like the traditional options and is completely non-irritating, non-sensitizing, and dermatologist tested. It's pricey, yes, but in this case, you get what you pay for. Dermalogica's oil-free, broad spectrum sunscreen is made specifically for breakout-prone skin, as the ultra-sheer formula contains a blend of zinc gluconate, caffeine, niacinamide, biotin, and yeast extract to help regulate oil production and soothe inflammation. It'll help you maintain a matte finish all day, all the while protecting your skin from UV light. 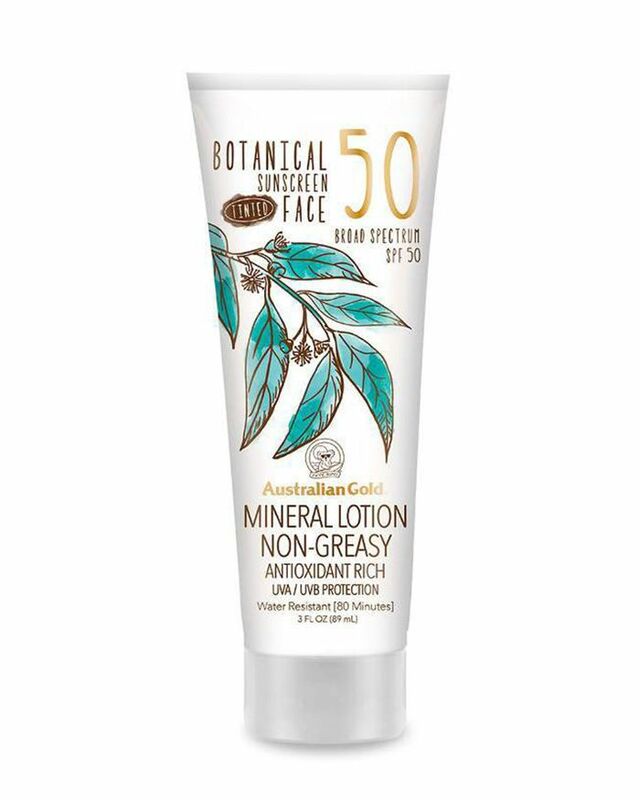 It's a miracle-worker in a bottle for oily skin types, trust me. 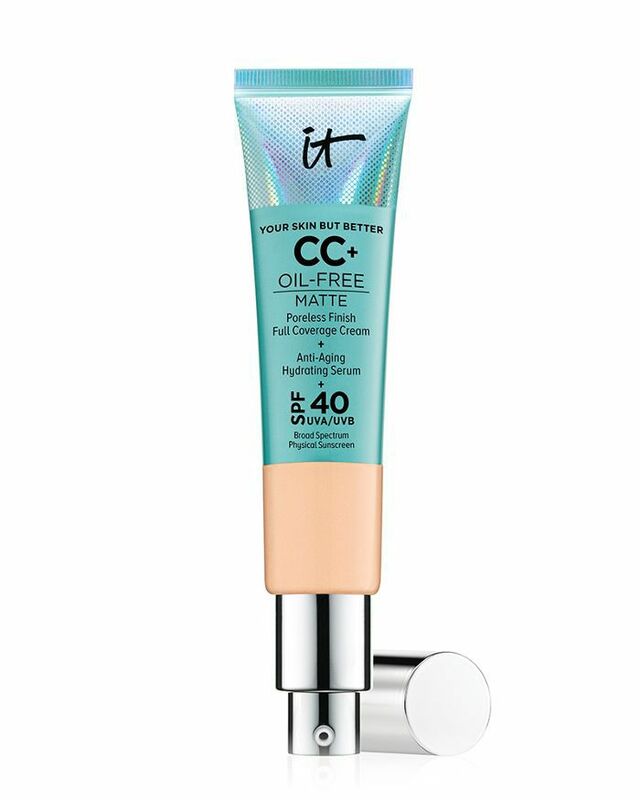 If you'd like your sun protection to come in the form of a full-coverage CC cream, It Cosmetics' formula is an internet favorite. It's a best-seller on Ulta and Sephora to boot, yielding tons of positive reviews. This is not for those who crave a sheer, dewy finish. The product delivers matte, all-day wear that leaves you looking practically air-brushed once it's applied. 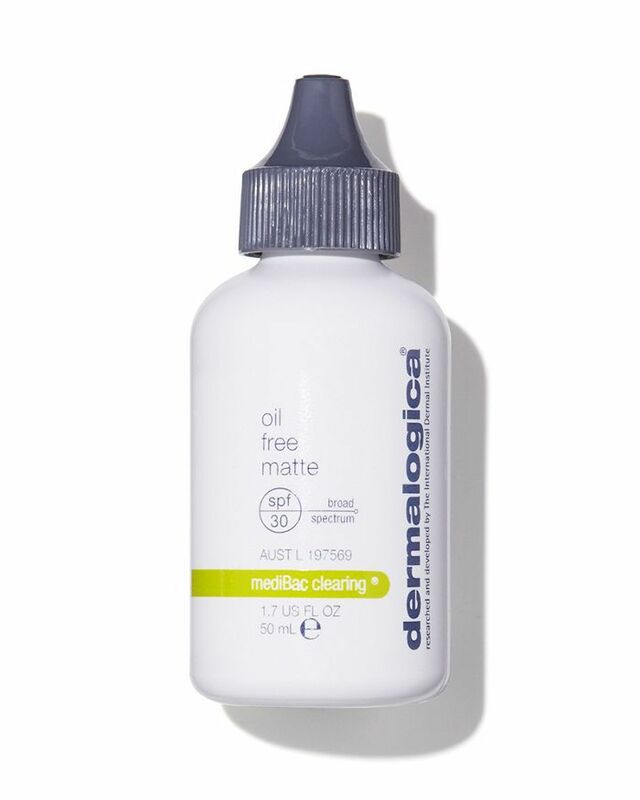 Included in the formula is charcoal to detoxify, clay to absorb oil, and tea tree extract to fight against breakouts. Plus, you'll get anti-aging ingredients like hydrolyzed collagen, peptides, niacin, hyaluronic acid, vitamins, and antioxidants, along with an SPF of 40. Brimming with vitamin E to help neutralize free radicals, this broad-spectrum sunscreen protects against environmental aggressors (which cause the first signs of aging). It's lightweight, noncomedogenic, absorbs quickly, and leaves a matte finish. Sephora reviewers raved over its ability to keep skin fresh-looking without leaving a white cast once it's absorbed. 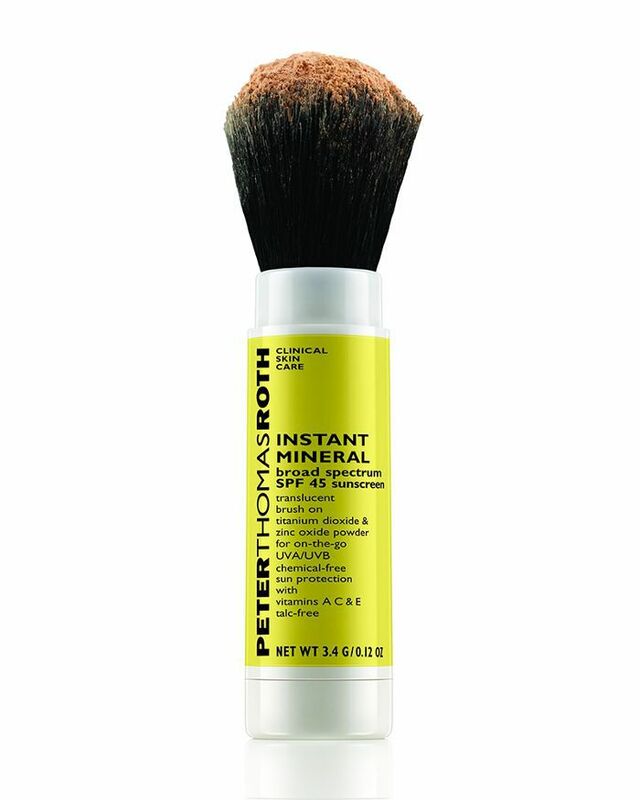 If creams and lotions aren't your thing, try Peter Thomas Roth's brush-on powder sunscreen. It's convenient (you can apply anywhere—in a cab, on the subway, at your desk), self-dispensing, and provides all-mineral protection with a matte finish. It can be worn alone, or with your usual makeup. 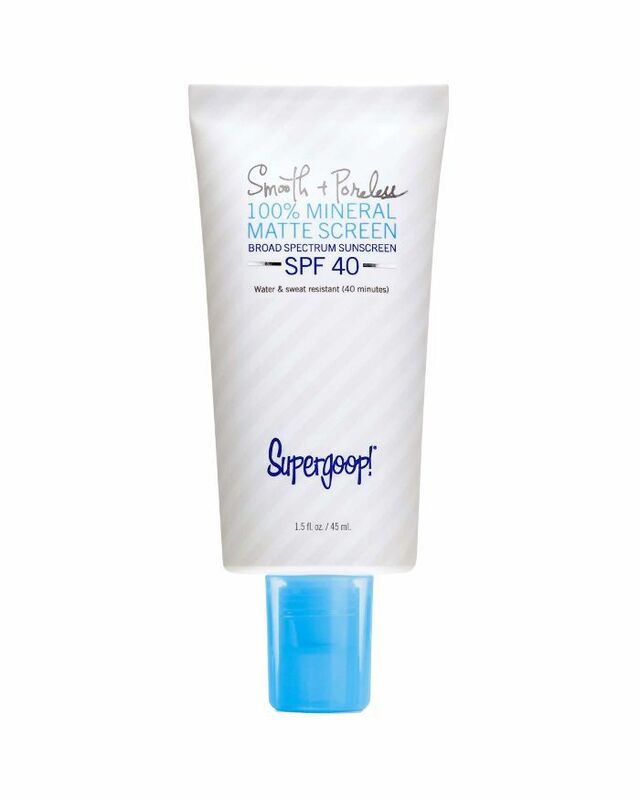 Supergoop's offering is a mix of bisabolol extract from chamomile (which helps soothe and calm your skin), blue skull cap and resveratrol (to brighten and defend against free radical damage), and butterfly bush extract (to provide blue light protection), as well as ingredients to keep your skin covered in regards to UV damage. It has a pore-blurring effect once it's applied, which keeps your skin matte and toned throughout the entire day. Next up: Nine beauty editors of color share their favorite sunscreens for dark skin tones.